Light trails and Prague Bridges. I took this photo on my last night in Prague. Before visiting the city, I came up with a shooting list and I knew that I want to create some iconic images of Prague’s bridges. 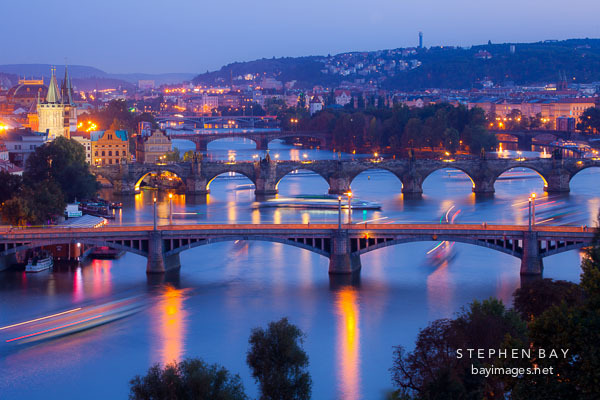 I had already shot the Charles bridge but hadn’t yet seen a good location where I could have multiple bridges in an image at once (there are 17 bridges in Prague that cross the Vltava river). I knew based on geography that I would need to be on north bank of the Vltava river to get elevated views but I wasn’t sure about the best vantage point. Normally I like to scout locations during the mid-day hours, but I hadn’t yet been able to explore the area to the north of the river. Looking at maps online, it seemed like the area around Letna park would yield the most promising viewpoints. I also pulled up Google Street View and virtually scouted a few locations. This spot seemed the best. I headed to the park early to give me enough time to check out other locations but eventually settled on the one I found in Google (viewpoints may be obstructed by buildings, or trees and street view is limited to the roads). Using Google street view to find shooting locations. To take the picture, I waited until after the sun had set to get the nice even lighting on the city and river. To capture the light trails from the river boats, I used an exposure of 20 seconds. The boats are slow moving and a long exposure was needed to get decent length trails. The boats have somewhat predictable movement patterns but I still shot a lot of images trying to get one where the trails were just right.